Bangaru Panjaram is the movie about the relationship and understanding between a husband and wife. In this movie Venu (Shoban Babu) is an engineer who travels various places. In his travel he meets a girl Neela (Vanishri). They both love each other and get married. But Venu's uncle wants him to marry his daughter. So he makes various plans and creates mis-understanding between Venu and Neela. Starring : Kongara Jaggaiah, S.V. Ranga Rao, Akkineni Nageshwara Rao, Vanisri, Jayanthi, Varalakshmi S., Gummadi, Shivaji Ganesan, Rajesh Khanna, Krishna Ghattamaneni, Shobhan Babu, Ramaprabha, Nagabhushanam, Rajababu, Chalam K.V. Directed By : Rajendra Prasad V.B. © 2018 Scratchu.com Bangaru Babu | Kongara Jaggaiah, S.V. Ranga Rao, Akkineni Nageshwara Rao, Vanisri, Jayanthi, Varalakshmi S., Gummadi, Shivaji Ganesan, Rajesh Khanna, Krishna Ghattamaneni, Shobhan Babu, Ramaprabha, Nagabhushanam, Rajababu, Chalam K.V. 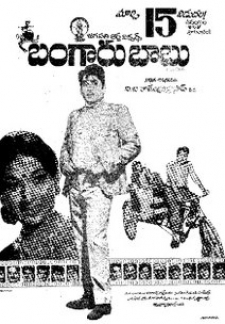 - Bangaru Babu (1973) | Telugu Movie | 6.6/10 | Synopsis : Bangaru Panjaram is the movie about the relationship and understanding between a husband and wife. In this movie Venu (Shoban Babu) is an engineer who travels various places. In his travel he meets a girl Neela (Vanishri). They both love each other and get married. But Venu's uncle wants him to marry his daughter. So he makes various plans and creates mis-understanding between Venu and Neela.... Watch Online!! !